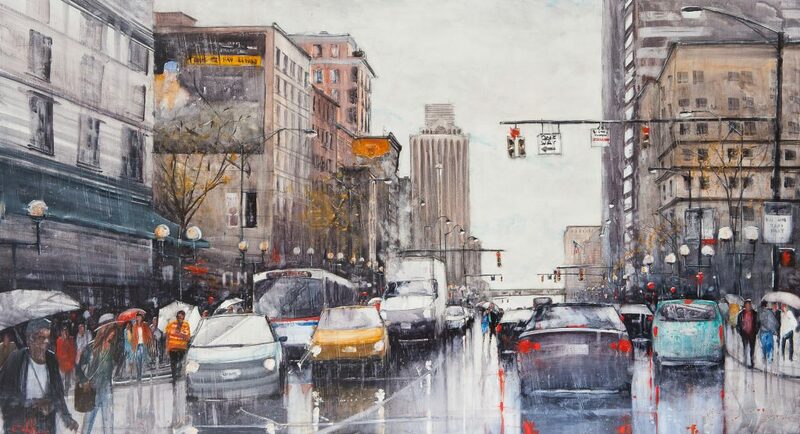 In “Crossing High Street” the viewer is placed in the center of a wet, busy intersection in downtown Columbus. Some pedestrians casually walk to their destination under the protection of their umbrellas, while others scurry along in their best attempts to stay dry. Cars don’t quite make it through red lights, causing buses and trucks squeak to a stop behind them. The weather is not inviting, but everyone continues about their days regardless. This is an enticing subject matter for me, and one that I am continually drawn to. The sound and movement of the subject are just as inspirational to me as the visual components are. My hope is to capture all of these elements in my work, so that the scene might play out like memory for the viewer. One that is imperfect, and void of the sharp details, but recalls what it felt like to traverse that busy intersection. Columbus-based watercolorist Cody Heichel uses bold colors and high- contrast tonality to create atmospheric interpretations of daily, and recognizable, scenery. Heichel aims to capture the mood and movement of his subjects through quick, spontaneous brushwork. The individual strokes that make up his compositions seem arbitrary and fluid. Mysterious figures often occupy the focal point of each composition, and it is through their individual appearance and body language, as well as the language of their surroundings, that the story of each scene unfolds. Urban cityscapes, rural settings, and national and international locales provide the inspiration for Heichel’s work. Heichel is a Signature Member of the Ohio Watercolor Society, and an Associate Member of the American Watercolor Society. 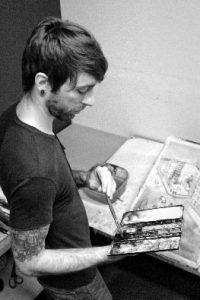 He works as an Art Facilitator at Open Door Art Studio, a non profit studio space and gallery for adult artists with disabilities. He has received numerous awards for his work, including the People’s Choice Award at ARC Ohio’s 2014 Art for Life benefit, as well as the Ohio Watercolor Society’s Merit Award. Most recently he was awarded First Place in the Columbus Through A Lens Competition, hosted by Le Meridien Columbus – The Joseph.